Join us in the beautiful Northwest, the home of the glacier-crowned snowy peaks of Mt. Hood, the grandeur of the Columbia River Gorge, endless forests, miles of spectacular beaches, and much more. To whet your appetite for Oregon’s many attractions, we recommend taking a look at traveloregon.com. The site’s 60-second video on “The Seven Wonders of Oregon” will give you a tantalising glimpse of Mount Hood, The Oregon Coast, The Columbia River Gorge, the Painted Hills, Smith Rock, The Wallowas, and Crater Lake. If a fishing expedition to the coast appeals, you’ll find helpful information for planning your trip at visittheoregoncoast.com/activities/fishing. July is a great time to explore Portland. If this will be your first visit, we predict you’ll be astonished at the variety of experiences our city offers; if you’ve been before, you know the list is endless. Stroll through the International Rose Test Garden, Lan Su Chinese Garden, the Portland Japanese Garden…enjoy a short hike through Forest Park, visit a farmer’s market, ride a streetcar, lose yourself in Powell’s Bookstore, discover the pleasures of an urban picnic at a food cart pod….On a clear day, you can catch sight of Mt. Hood and Mt. St. Helens from a thousand different vantage points, and the best news is that we have mostly clear days in July. We recommend starting with a visit to travelportland.com/things-to-do for a preview of Portland’s personality. Plans are being made for a Portland city outing on Friday for those who come in early. Saturday, after our board and members meeting, we are also planning a group activity. A paddleboat ride down the Columbia River or paddling our own kayaks and canoes in the Willamette River are some of the ideas that have been ‘floated’ so far. Troutdale is the gateway to both the scenic Columbia River Gorge and the slopes of Mount Hood. Bring your family and make a holiday of this great location! Saturday evening is the traditional Schutz Reunion banquet. 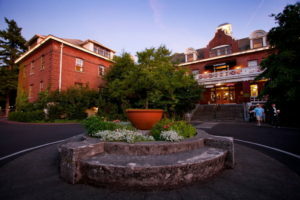 It will be held in the grand ballroom at the Edgefield Hotel, and will include the long-awaited Schutz Jeopardy Game. 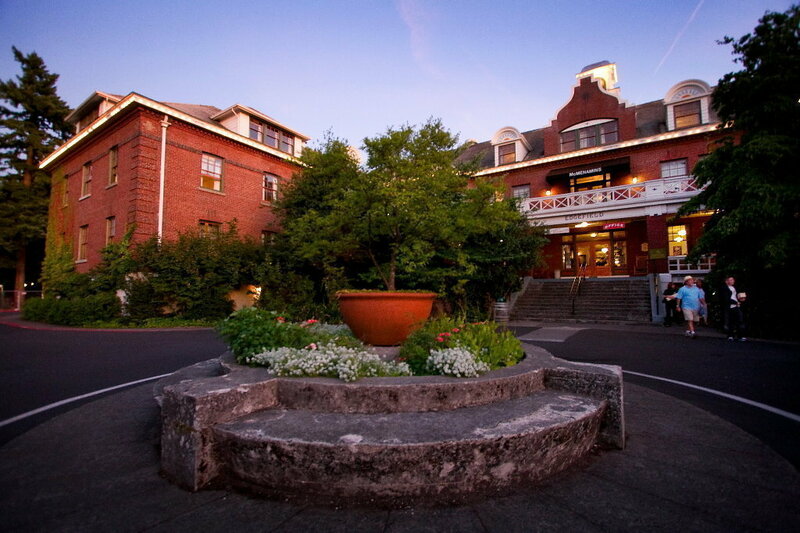 The Edgefield Inn is commonly booked years in advance, so we’re fortunate to have a block of rooms set aside for the “Schutz Alumni Reunion.” There are hostel bunk rooms at the Inn, but we hear they may be sold out. Room reservations and payment are your responsibility, so we recommend that you book accomodations early. Be Sure to ask for the “Schutz Alumni Reunion” block of rooms. First-come-first-served! Make your reservations ONLY by calling the phone numbers above and asking for Schutz Alumni Reunion Block. You can not register online. If you have specific interests or questions, please email us at schutzalumnireunion@gmail.com and we will endeavor to find an answer or point you in the right direction. REGISTER BY MAIL. CLICK HERE TO PRINT OUT A REGISTRATION FORM. Registration fee includes Friday and Saturday lunches, Friday supper, the Saturday banquet, activities, outing transportation, tips and a reunion memento. Register by April 30 for a discount – the deadline for forms is May 31st. Fee per person is $85 after April 30. Fee per person $40 for accompanying spouse, child or friend attending the Saturday night banquet. 6:00 PM: Dinner: Probably outside–weather is lovely in Oregon in the summer. There will be an outdoor concert that night, Sylvan Esso at the Edgefield amphitheater (Info on Wikipedia about Sylvan Esso) Without having to buy tickets, we will be listening in as we eat a catered meal and visit with old (and new) friends from Schutz. Tickets are about $65, if you do want to spread out a blanket with the concert crowd! 9:00 AM: SASAF Board Meeting in the Edgefield Ballroom, 2nd floor. Everyone is welcome! Please fill out the registration form below. Once this form has been submitted, you will be redirected to STEP 2 – Reunion Fee page.